The seismic evaluation and retrofit of water transmission infrastructure is an area of growing concern to utilities that own large water conveyance systems. Many water and power utilities today rely heavily on water transmission structures built in the 1930s or earlier without regard to seismic design. Today, utilities are finding that these facilities are threatened by many seismic hazards including liquefaction, landslides, surface faulting and ground shaking. If these facilities are not seismically strengthened, they pose a significant threat to the utility's ability to provide water for customer service, for fire fighting purposes after major earthquakes, or to supply hydroelectric facilities. 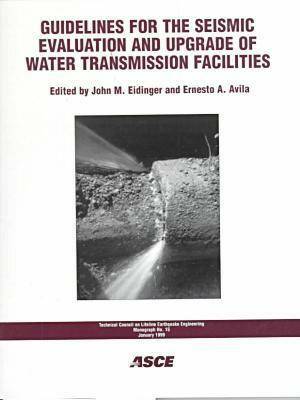 This book provides guidelines for the seismic evaluation and retrofit of water transmission infrastructure, including aqueducts, tunnels, canals, buried pipelines, elevated pipelines and their appurtenances. The current state of the practice in seismically strengthening these key facilities is covered, as well as past performance during earthquakes, performance criteria, risk analysis, and analysis methods. Case studies address seismic designs and retrofits for the Mokelumne Aqueduct, the Contra Costa Canal, the Borel Canal, buried pipes at fault crossings, and auxiliary water fighting systems. These case studies examine the technical, geotechnical and structural disciplines, as well as post-earthquake operations, financial issues and benefits of seismic retrofits.